Fall is in the air, as we settle into familiar routines - school and swim practices resuming, sweaters and apple or pumpkin flavoured sweets everywhere, and beginning to set our goals for the season and school year ahead. But everyone knows goals are not enough on their own. It is equally important to track and measure progress along the way. Schools provide report cards along with constant marked feedback, to help students gauge progress. The swim practice equivalent to this is the concept of test sets. The question around test sets isn't should they be a standard component of a training plan. Instead we should ask what to test, and how to measure and utilize the results. Tests must serve a specific purpose, and result in something tangible we can work on. Measurement and analysis is simple with TritonWear. Automating the collection and calculation of data gives any set the potential to be a test set. This is because each TritonWear swimmer's profile contains all their historical data, so any combination of similar sets can be combined for review. Comparing data from similar sets and reps over time easily highlights changes and areas for improvement. To ensure conditions are considered for comparing sets. For instance, comparing sets from a distance and sprint workout together may skew results. Because test results are only as valuable as the effort put into them. If athletes don't see a difference between training and testing, tests will not be at 100% effort. Having TritonWear has proven to motivate athletes to give more every practice. However, this does not translate to competition level effort certain test sets require. this type of test is speed based, and designed to test the bodies ability to sustain speed at a distance. This type of test will typically be a succession of 200 m reps in various strokes. Most often freestyle is used, as it has the least variability in terms of performance inhibitors. Aerobic tests will reveal if additional endurance training is required to optimize a swimmer's competition results in mid and long distance races. As anaerobic literally means a lack of oxygen, this type of test is meant to test the bodies ability to perform with minimal oxygen intake. This highlights how well a swimmer performs at peek speeds, to determine if additional sprint training is required. This would typically be assessed using a succession of 50 m reps. Again, most often freestyle, but all strokes can be tested here as well. This is a very technical test, using blood samples to measure the lactic acid buildup after high intensity reps. The concept at play here is to measure the bodies ability to process and tolerate lactic acid. The result being to identify the peek speed a swimmer can perform at over short and long distances. A well-known test for this is the 200 m step test. This article by top end sport perfectly explains the concept and implementation of this type of set. This type of test is not about endurance or speed, but about proper execution of strokes, starts and turns. Using paddles, kick boards, bands, etc. can assist in identifying areas for improvement in each stroke. IM sets are great for providing a view of all strokes, and turn types in each rep. These will be at a slower than usual pace, to allow the swimmers to focus entirely on their form and flow through the water. Often coaches use underwater cameras to capture the techniques at play, and review with swimmers to point out exactly where adjustments can be made. Here we can use kick or pull sets to test for strength in these areas. But tests for strength won't always be in the water either; sometimes they will be jump tests to determine the physical power of a swimmer to burst off the blocks. The point of these is to determine if additional core or strength training is required to optimize a swimmer's ability to move through the water most effectively. Efficiency can be measured on several components of swimming. It may be a measure of the reaction time off the blocks, the speed of turns and duration and distance on the kick out. A key measurement of efficiency is the concept of Stroke Index, which we wrote about a few weeks back. This metric measure speed by distance per stroke, with a cycle multiplier to keep the results even across all strokes. The key to test sets is recording the data; collecting a history of performance in these sets to track progress. Historically this has been a combination of coaches and swimmers collecting different metrics. The coach on splits and speed, the swimmer on stroke counts per rep. After the workout, coaches take all the data collected, and plot it manually in excel to see progressions. This takes hours of manual effort, a tedious task requiring vast amounts of effort for limited gain, as many metrics are still not collected. TritonWear was built for this my friends! 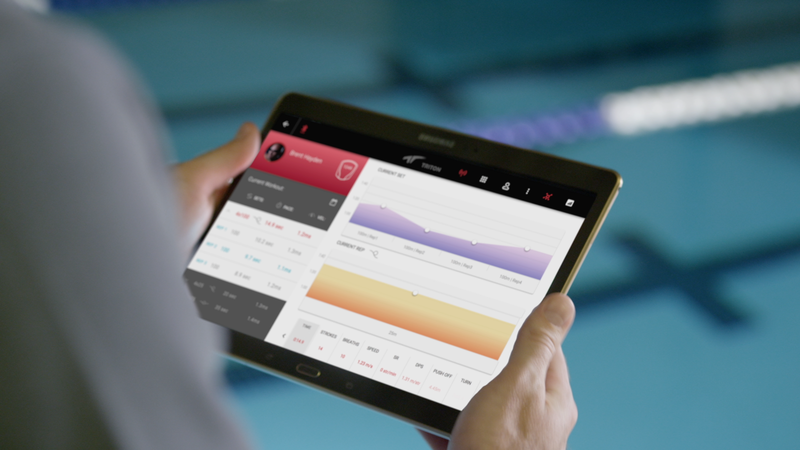 Collecting 12+ metrics for each outfitted athlete every time they swim. This eliminates manual data collection, provides significantly more information per swimmer, and isn't limited to infrequent test sets. Having the ability to compare similar sets across any athlete, or even compare athletes to one another, is a next level benefit of TritonWear. Additionally, for aerobic, anaerobic, and lactate measurement, training zones are a great way to test progress throughout the season. The concept of Training Zones (i.e. REC, EN1, EN2, EN3, SP1, SP2, SP3) is technical. To make it easier to digest, Jon Urbanchek created a colour coding system. This article by MySwimPro does a great job of explaining the theory and practice behind it.